Jon and I picked up this wine on our California trip in Spring 2013, when we had the good fortune to visit Husch Vineyards. I opened it up last night, after putting a couple of bottles of white wine in the fridge to chill a bit. Now that it’s spring, I’m enjoying my whites even more! I couldn’t be more pleased. It has flavors of pineapple blended with minerality, giving it a balanced flavor that I love. It has just a hint of sweetness on the tip of the tongue, with a lingering light honey syrup on the back of the palate. Husch has been producing their Chenin Blanc since 1984, and they have clearly been doing something right. It is fermented in stainless steel tanks, and bottled only a few weeks after fermentation was complete. Not to mention it is a great value at just $12.00 a bottle. 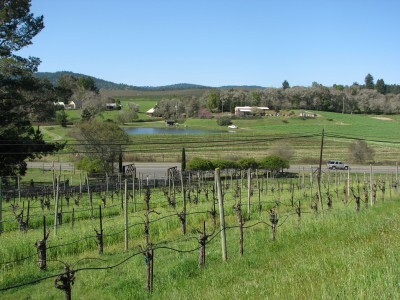 Have you had the Husch Vineyards Chenin Blanc? 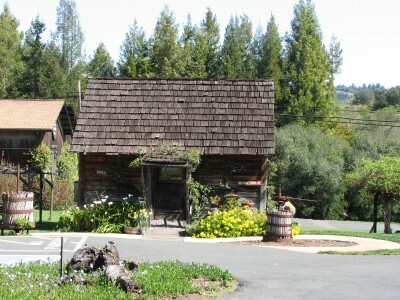 Have you been to the Anderson Valley? After our Blind Tiger experience, we headed back out to continue touristing. We headed over to the Old Slave Mart Museum. The Old Slave Mart was Ryan’s Mart, which operated as a slave market for domestic slaves (born in the US, not brought from Africa). The market operated from 1856 to 1863, after Charleston banned public slave auctions (which used to occur on the north side of the Exchange building – I talked about this building in my previous post). Slave auctions were getting to be a bit controversial at that point – by the 1850s abolitionists like Horace Greeley, editor of the New York Tribune, were beginning to cover slave auctions and provide a social commentary about the cruel conditions that the slaves were subjected to. The legal trans-Atlantic slave trade had already come to an end in 1807 – although that did little to curb illegal transport of slaves to the U.S. In 1852, Harriet Beecher Stowe wrote Uncle Tom’s Cabin, which brought the cruelty and barbarity of slavery to Americans who had likely not thought about it much. 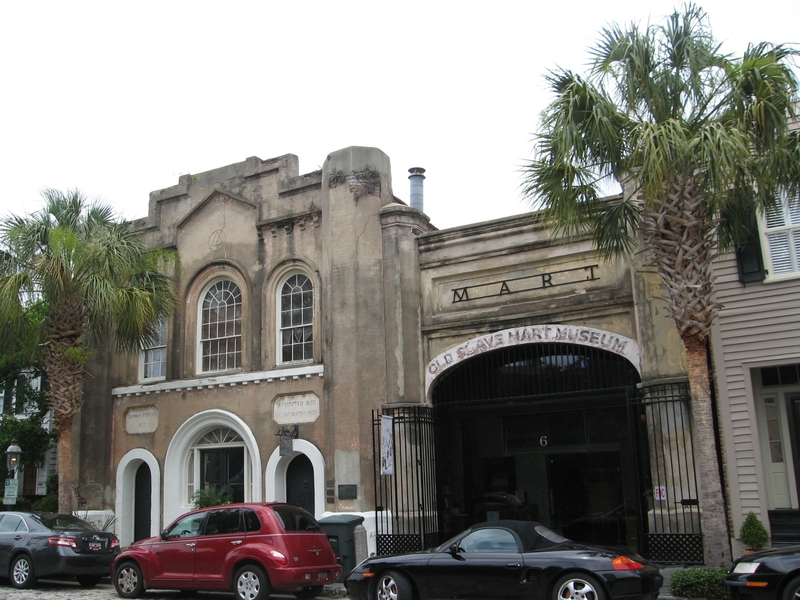 Ryan’s Mart opened as an indoor “gallery-style” slave market, because by the mid to late 1850s, abolitionists were gaining a foothold in the court of public opinion, and Charlestonians thought it best to move these disturbing auctions behind closed doors. To be honest though, I found the museum a bit disappointing. It goes through the basics of slavery in South Carolina, but it was really information that I already knew. Sadly, the building doesn’t have any of the original features remaining – I think the exhibit would have been much more compelling if they had restored the building to what it had been at the time. Instead, they have covered it up with drywall and poster board exhibits. It was a decent basic overview of slavery, but I wanted to see more that was specific to this slave market and how it affected the lives of those passing through here. One interesting fact that I learned though, is that only 15 men in the U.S. owned more than 500 slaves (9 of them were in South Carolina). Another interesting fact (from online), is that there were about 385,000 slave owners in the U.S. in 1860, which was about 1.4 percent of the population. 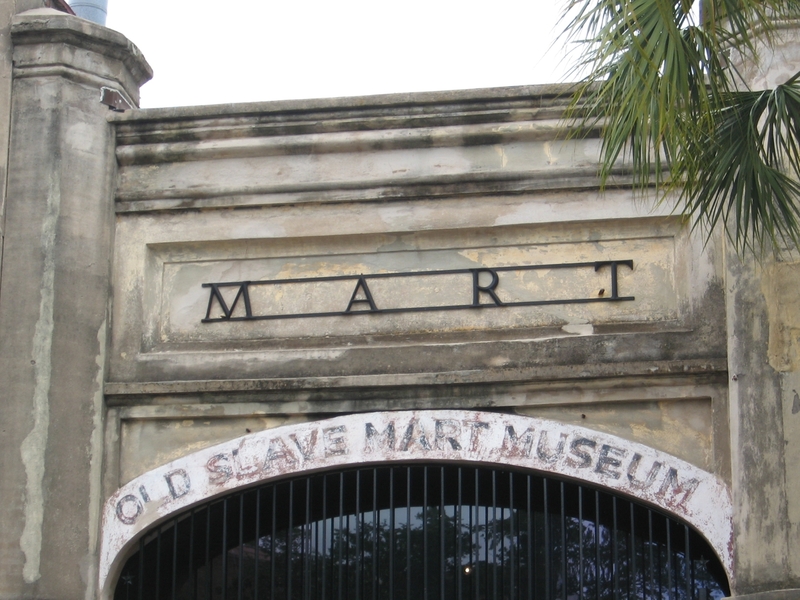 Closeup of the Slave Mart Museum Sign – Maybe the Lettering is from Miriam Wilson’s Day? 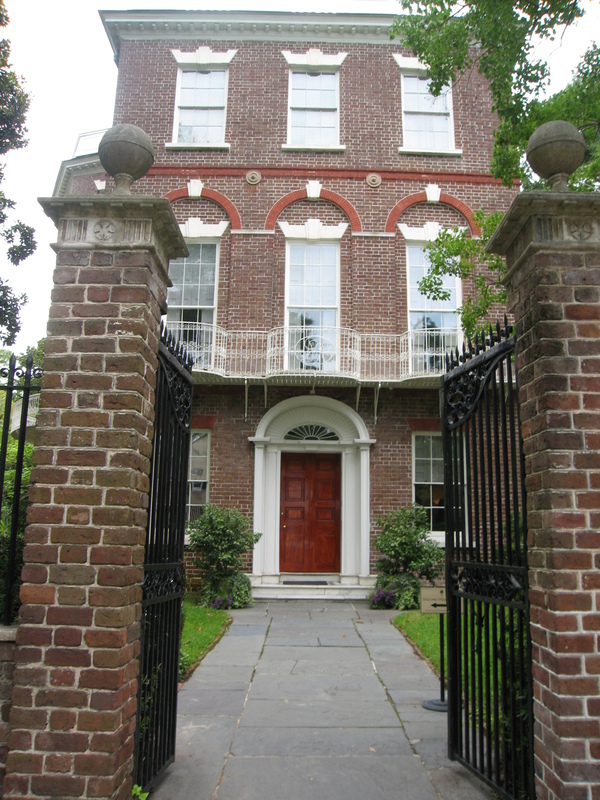 After the Slave Mart, Jon and I decided that instead of going back to the Edmonton-Alston house, which was now further away than we wanted to walk, we would go to the Nathaniel Russell house. Nathaniel Russell was the wealthiest merchant in Charleston in the early 1800s. He had already made his fortune by the time he made this town house his home, having it designed and built in 1820. Impressive features of the home include a 3 story completely free flying staircase. 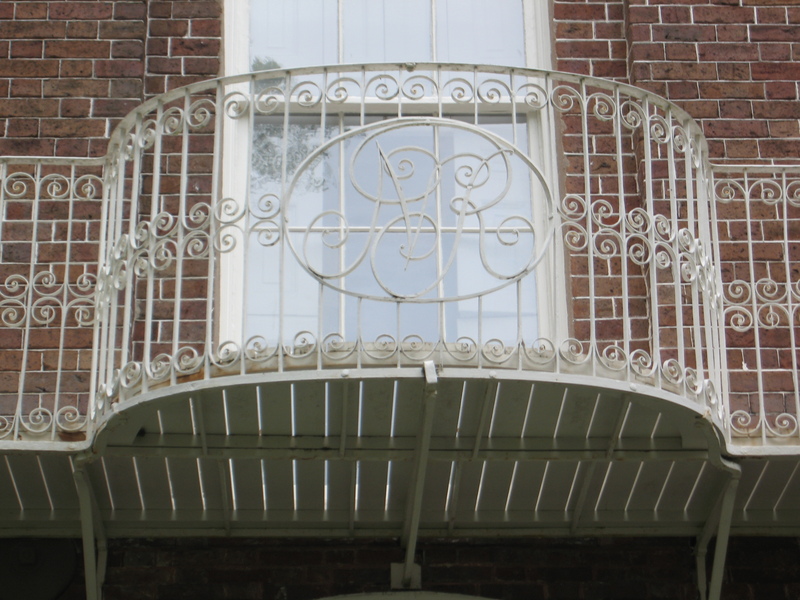 It balances its weight completely on the steps below and is not attached to the wall or supported by columns or a wall down to the floor. 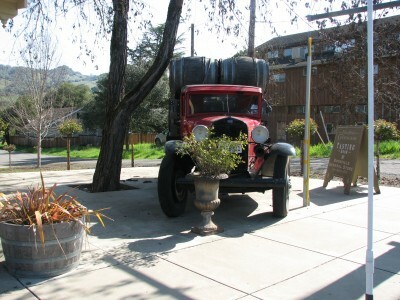 And it has withstood hurricanes for almost 2 centuries and the 1886 earthquake! 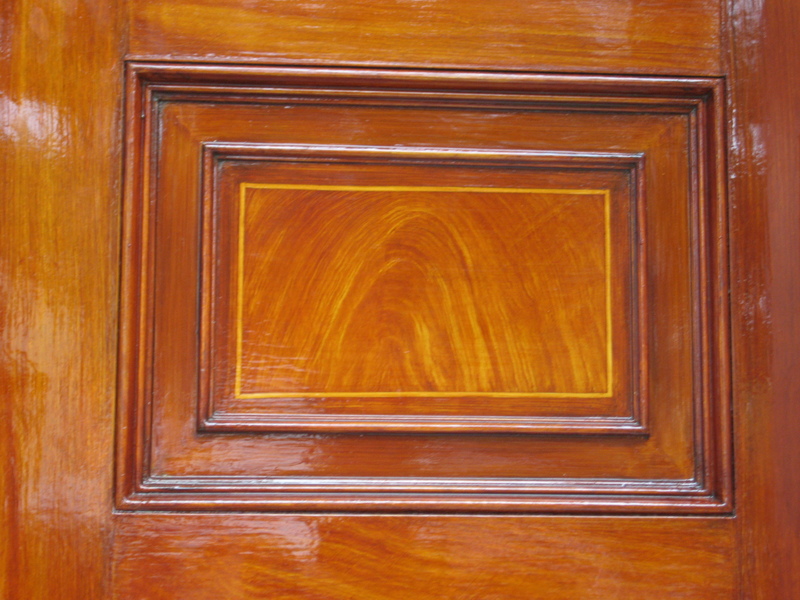 The home also has trompe l’oeil doors and baseboards. 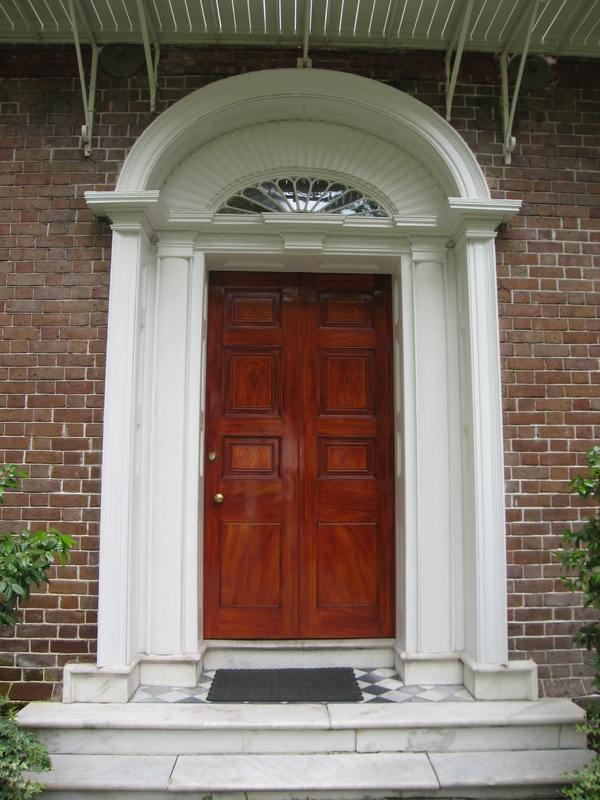 The doors are painted to look like expensive hardwood, when in fact they are pine, which was plain but was frequently used because it withstood the barrage of southern insects. The baseboards around the home were painted to look like marble – they were very realistic looking! Can you imagine – we could all just have our counter-tops painted to look like granite, instead of paying for the real thing! Honestly, I’m not sure that would be any less expensive, thinking about the hours it must have taken to do all that painting. The tour guide at the Nathaniel Russell house was great, with lots of excellent information about the house and the family. He was a true southern gentleman. I wanted to call him Ashley… like in Gone with the Wind! 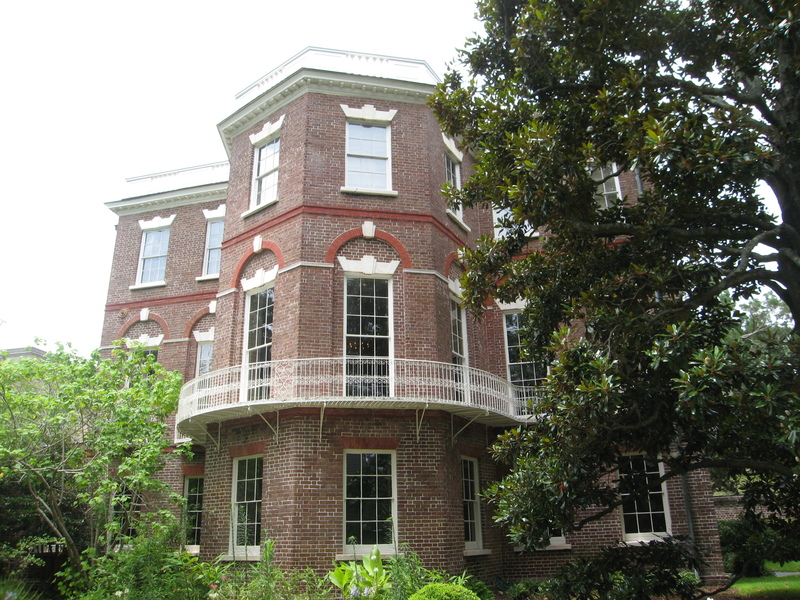 The Side View of the Nathaniel Russell House – Inside the Rooms in This Area Are Circular! The heat and humidity were starting to get the best of us by this time, so we found a frozen yogurt place and cooled down with a bit of a treat. Cece’s yogurt shop is across from the City Market and we had admired some sweet grass baskets earlier, which are hand woven from sweet grass, and also using bull rush, palms and pine needles. 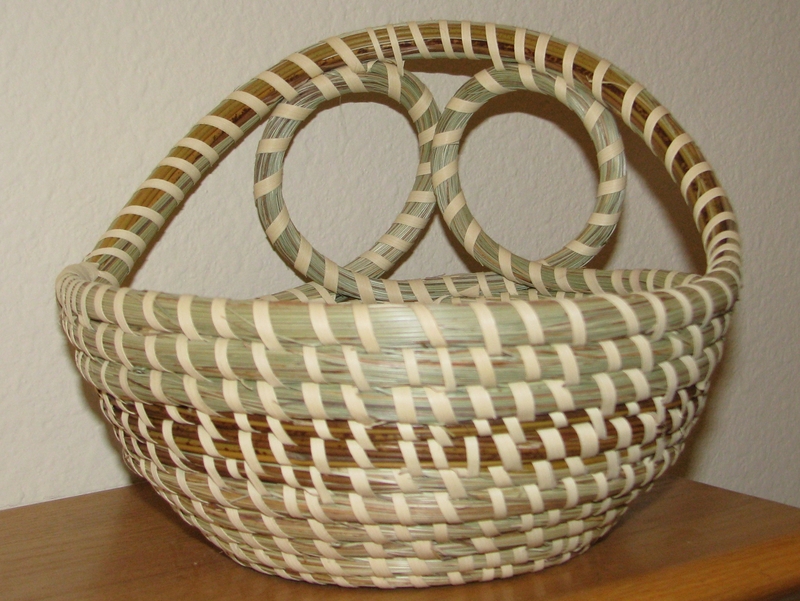 The are truly works of art, taking lots of time to complete one basket. 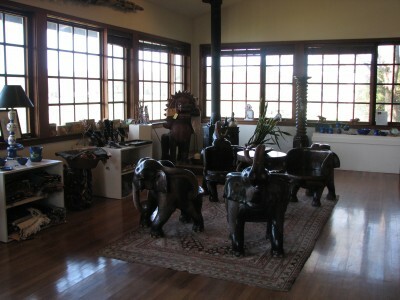 As a result, there are baskets ranging from $30 up to several hundreds of dollars for the very large, ornate ones. One day I’ll be able to afford one of those. In the meantime, Jon and I chose one to bring home that is medium sized; we think it is beautiful. An excellent memento from our trip. Then we made our back (a little more slowly now) to the Visitor’s Center on very sore feet and legs. We didn’t feel like having a restaurant meal (getting a little burned out on restaurant food), so we got a dinner of sandwiches, yogurt and fruit from the local Piggly Wiggly. We got back to our hotel just as a new thunderstorm rolled in, and the torrential downpour began again. We soothed our tired backs and aching feet with some true crime TV and Biltmore Estate wine – the Chenin Blanc this time! And I was happy that we made so much of the day!